Quick — think about the planet you live on. What does Earth look like from above? Probably, some very clear imagery just popped into your head – iconic Apollo-era photography, or perhaps the more contemporary view of the planet from the orbit of the International Space Station. But our generations – ours, our parents’ and grandparents’ generations – are unique in human history. We’ve been given these images by the radical breakthrough of our species leaving Earth, via our own human spaceflight and myriad machine exploration missions. Earth imagery may well have even saved our species. The Atomic Age gave us the nuclear arsenal capable of wiping out life on Earth, but it also gave the public and world leaders a tangible picture of just how fragile that planet could be. 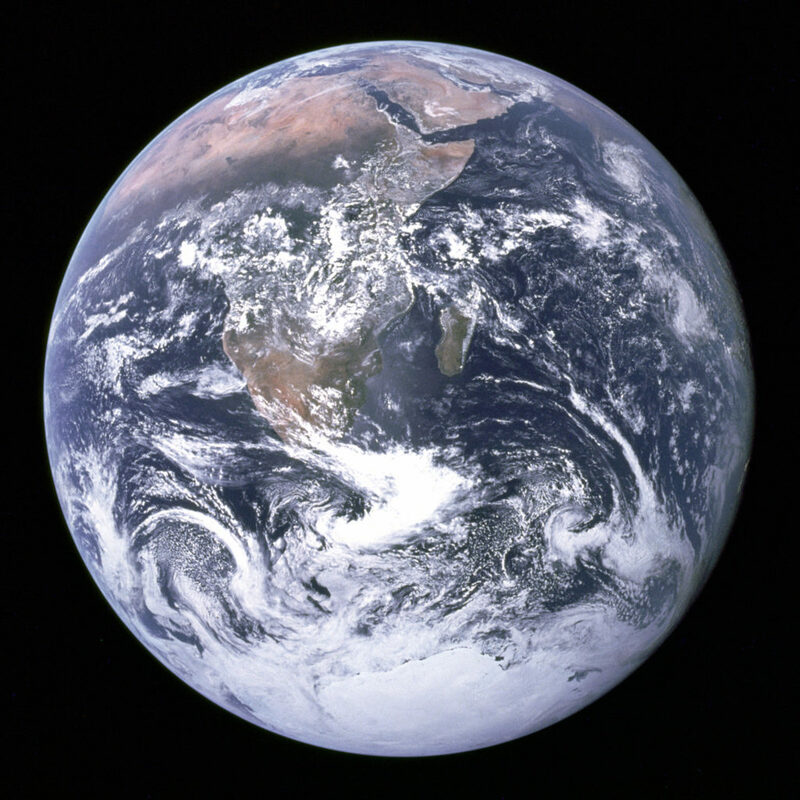 The “Blue Marble” image from Apollo coincided with some of the deepest tensions in nuclear escalation, and planetary science, advanced by this same imagery, was able to go into specifics about the dangers of nuclear winter (as it now continues to warn us of the threats of climate change). And Earth is just the beginning, as we’ve looked deep into the cosmos and clearly into our planetary neighbors. And free access to this content has been a big part of what has helped this imagery find its way deep into public consciousness, from research to advertising to artwork. The cultural impact is not to be overlooked: even sci fi television has inspired future astronauts. And space media is unique of all the cultural artifacts produced by humans, because it gives us a window into what would be to nearly all of us inaccessible. Only a handful of people can gain access to spaceflight facilities, let alone go into orbit and peer out the cupola of the ISS. And satellites and rovers can boldly go where no one will go, ever. So because we don’t have the power to produce this media ourselves, we rely on that access. And, oh yeah, your tax money paid for it, too – so it’s nice to get a return on investment. Having access to American content was a good first step. Now it’s Europe’s turn. And the European Space Agency’s media should be uniquely interesting to the sorts of people who read this site. ESA has led some of the most compelling scientific missions in recent years, both in terms of observing our own planet and exploring the solar system and further universe. ESA is also far more engaged in artistic collaboration than any of its other partners (even NASA), and does so inside the framework of a network of European institutions similarly dedicated to finding connections between arts and science. In one sense, ESA faces extra challenges beyond its counterparts. The agency’s venture into open licensing is newer than NASA’s, and has to explicitly license content since nothing is generally public domain by default. It also involves a greater number of partners, because ESA is by definition a joint project of a number of European nations (on top of the usual private partners). But we’re at an historic moment, as years of groundwork at ESA have now led to a public, wide-reaching release of content into the commons. And this includes all the necessary ingredients to making this a success: a public commitment on a philosophical level, a bunch of content, a clear permissive licensing scheme, and well-organized access so anyone can get at all the good stuff. The result is a new landmark, freshly employing a more contemporary approach to Creative Commons and a focus on new and bleeding-edge materials – because, really, it’s time to leave the Apollo era behind and see our cosmos through new eyes (and ears). Europe’s efforts place content under a Creative Commons Attribution-ShareAlike 3.0 IGO (intergovernmental/international) license. The ShareAlike restriction is really useful; unlike public domain content, it ensures derivative content will be equally permissive. But note at the same time there’s no non-commercial restriction – which is good, because there’s no bright line test for what constitutes a “commercial” application (and all of us need to eat!). ESA joins other intergovernmental organizations like the UN Educational, Scientific and Cultural Organisation, the World Intellectual Property Organisation and the World Health Organisation. This also benefits the likes of Wikipedia and its Wikimedia Commons. Okay, now having gone into the history and rules – what’s there? 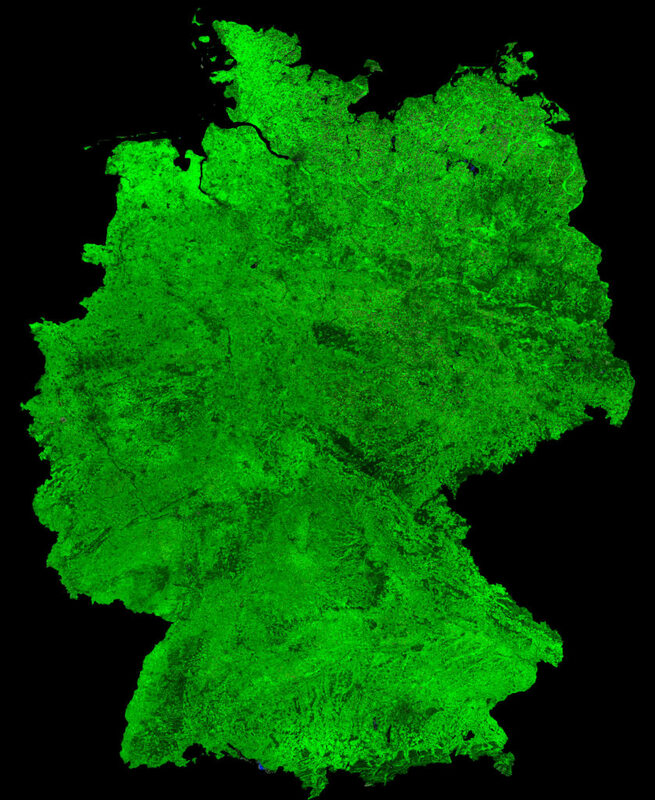 Germany – in a new image released today. Credit: ESA/Belspo – produced by VITO, CC BY-SA 3.0 IGO. Loads. There’s every kind of content imaginable. You can find photos and videos and work them into VJ sets. There are data sets you could try sonifying, or 3D print into sculptures. And yes, there are sounds – some contributed by yours truly, as part of an initiative I hope to continue to build upon. We have so much in the form of imagery and video that a lot of people may not appreciate just how powerful data and sound could be. Sounds are a fundamental part of how scientists and engineers do their job on Earth, how they diagnose technology in space, and how they process information and data from space. Indeed, a lot of what we can process on our human scale from the cosmos comes in the form of waves and vibrations, either directly sonic or in forms that can be easily translated to sonic timescales. Beyond that, I think data will be a rich new area to mine for artists and researchers – and a medium in which artists and researchers can potentially collaborate. And the ESA announcement in this regard couldn’t have come at a more important time. The incoming United States administration has threatened to scrap Earth observation missions, and gone far enough toward suggesting climate change-related datasets would be scrubbed that scientists were scrambling to make backups and public clones. At best, while this data is public domain, it could threaten NASA and climate agency work by the US government to keep that data easy to find for a non-technical public. So having a renewed public effort to share data on the European side, and make it easy for the public to find and understand, is obviously relevant. Now, maybe your experimental ambient album made from climate change data isn’t going to save the world. But anyone learning how to find and read data, and sharing what they’ve learned, is contributing to a better-informed public that can converse more easily with scientific specialists. And whatever your political inclinations, I think you’ll agree that’s a good thing. We live in a rapidly changing world and economy driven by reams of data. And that means that the public needs to find ways to get smarter about how to handle that data, not just specialists. When you make a piece of music, you’re also learning about data processing, about coding, and about handling scale and perception. That’s knowledge (and code, and sonifications, and more) that we can share with scientists and share with students. In fact, I think that one reason it’s great musicians ad artists are getting into this is precisely because this is out of our usual comfort zone. (I’m sure my high school physics teacher will attest to that.) To shamelessly paraphase President Kennedy, we can do it not because it’s easy, but because it’s hard. It’s worth reading that whole story, because ultimately the conclusions go beyond Trump. The hackers wind up helping to assemble centralized, independent, easily navigable datasets that weren’t available in any form before – and recognize the importance of independent scientific information, free of any government involvement. These kinds of discussions, while acute at the moment in the USA, are ultimately global. They’ll be part of policy debates all over the world, and from specialists to newcomers, we’re all learning how to better understand and share data. I think adding cultural voices to this discussion is significant. And wherever you are on the political spectrum, I think we all have a basic human need to change perspective and get out of the microcosm of political debate. Imagining space exploration, our Earth, and our universe is a rich common realm for that imagination. I hope we’ll get the chance to examine more what’s available. I can’t think of a better way I’d want to see my Euros and VAT spent. We’ll keep you posted if any especially interesting new content comes online!